SUBSCRIBE WEDNESDAY 20.3.19 WWW.IRISHGOLFER.IE CONTENTS AGENDA COLUMNS & OPINIONS PREVIEW THIS WEEK'S EVENTS NEW GEAR THE LATEST KIT REVEALED WEEKLY ROUNDUP THE LATEST GOLF NEWS VIDEO OF THE WEEK Digital Editor: Peter Finnan peter@matchplaymedia.ie Tel: 01 5036099 Print Editor: John Shortt john@matchplaymedia.ie Tel: 01 5036090 Sub Editor: John Craven CONTACT US Match Play Media Disclaimer: Copyright Match Play Media 2019. The publisher cannot accept responsibility for, nor do they agree with any of the views expressed, statements or claims made in any article, news items or advertisement published in this magazine. 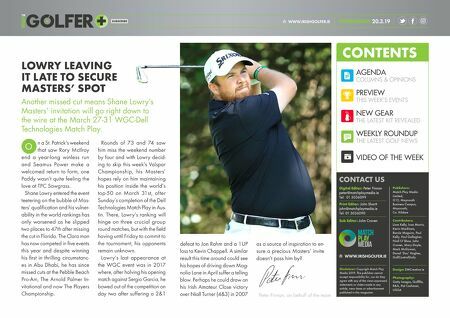 WWW.IRISHGOLFER.IE Publishers: Match Play Media Limited, G13, Maynooth Business Campus, Maynooth, Co. Kildare Contributors: Liam Kelly, Ivan Morris, Kevin Markham, Bernie Maguire, Paul Kelly, Paul Gallagher, Niall O'Shea, John Craven, Mary Doyle, Mark McGowan, Donal 'Doc' Hughes, GolfCentralDaily Design: EMCreative.ie Photography: Getty Images, Golffile, R&A, Pat Cashman, USGA Peter Finnan, on behalf of the team O n a St. Patrick's weekend that saw Rory McIlroy end a year-long winless run and Seamus Power make a welcomed return to form, one Paddy wasn't quite feeling the love at TPC Sawgrass. Shane Lowry entered the event teetering on the bubble of Mas- ters' qualification and his vulner- ability in the world rankings has only worsened as he slipped two places to 47th after missing the cut in Florida. The Clara man has now competed in five events this year and despite winning his first in thrilling circumstanc- es in Abu Dhabi, he has since missed cuts at the Pebble Beach Pro-Am, The Arnold Palmer In- vitational and now The Players Championship. Rounds of 73 and 74 saw him miss the weekend number by four and with Lowry decid- ing to skip this week's Valspar Championship, his Masters' hopes rely on him maintaining his position inside the world's top-50 on March 31st, after Sunday's completion of the Dell Technologies Match Play in Aus- tin. There, Lowry's ranking will hinge on three crucial group round matches, but with the field having until Friday to commit to the tournament, his opponents remain unknown. Lowry's last appearance at the WGC event was in 2017 where, after halving his opening match against Sergio Garcia, he bowed out of the competition on day two after suffering a 2&1 Another missed cut means Shane Lowry's Masters' invitation will go right down to the wire at the March 27-31 WGC-Dell Technologies Match Play. LOWRY LEAVING IT LATE TO SECURE MASTERS' SPOT defeat to Jon Rahm and a 1UP loss to Kevin Chappell. A similar result this time around could see his hopes of driving down Mag- nolia Lane in April suffer a telling blow. Perhaps he could draw on his Irish Amateur Close victory over Niall Turner (4&3) in 2007 as a source of inspiration to en- sure a precious Masters' invite doesn't pass him by?